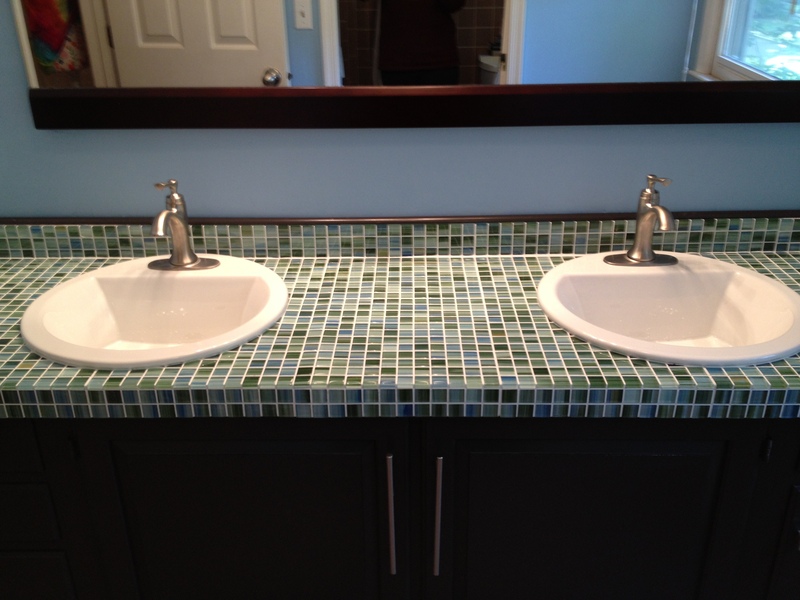 The tile we chose comes in a 12×12 inch square, with individual tiles glued onto a net backing. 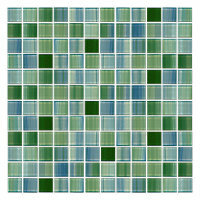 This makes it simple to cut out and remove tiles as needed. 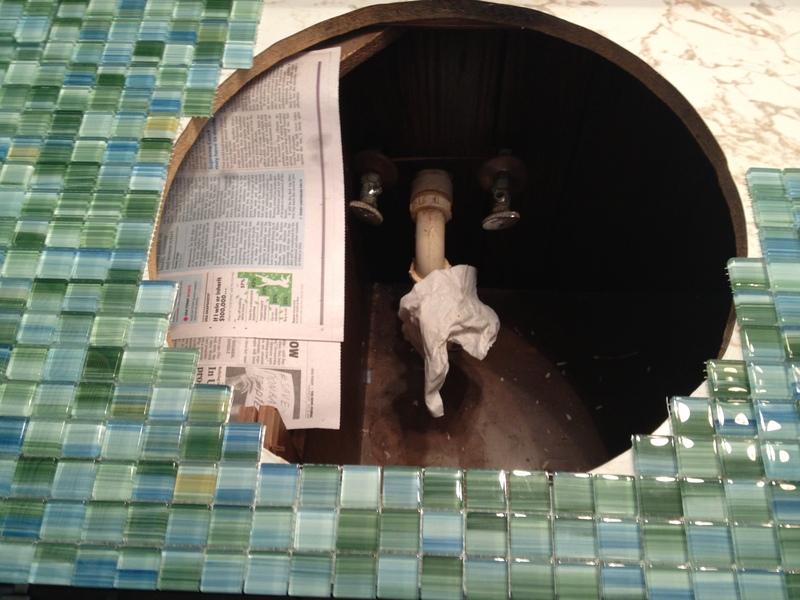 Remembering the builder’s adage–measure twice, cut once–I laid out the tile to see where any cuts or adjustments were needed, especially around the circular sink cut-out. With a plan in place, it was time to start tiling. First, I sanded the countertop with an electric sander since the thin-set adheres better to a rougher surface. 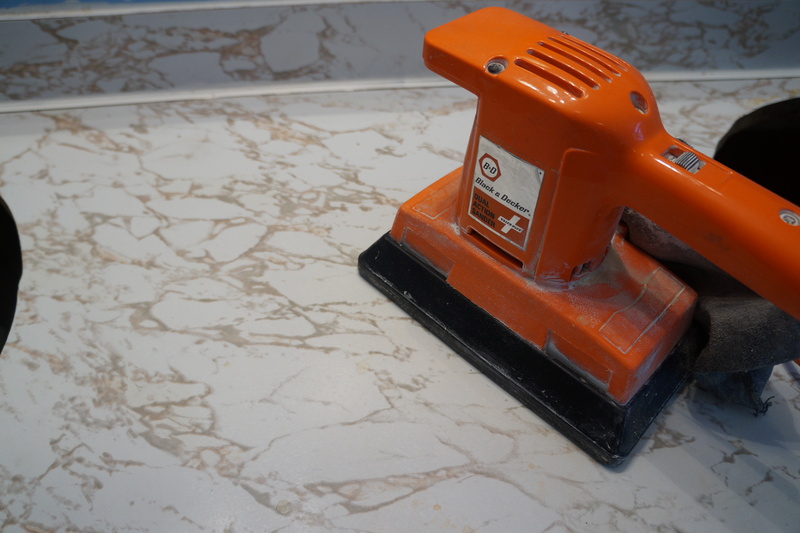 Using a notched trowel, I spread the thin-set directly onto the Formica countertop, covering only enough area to apply one or two tile squares at a time. 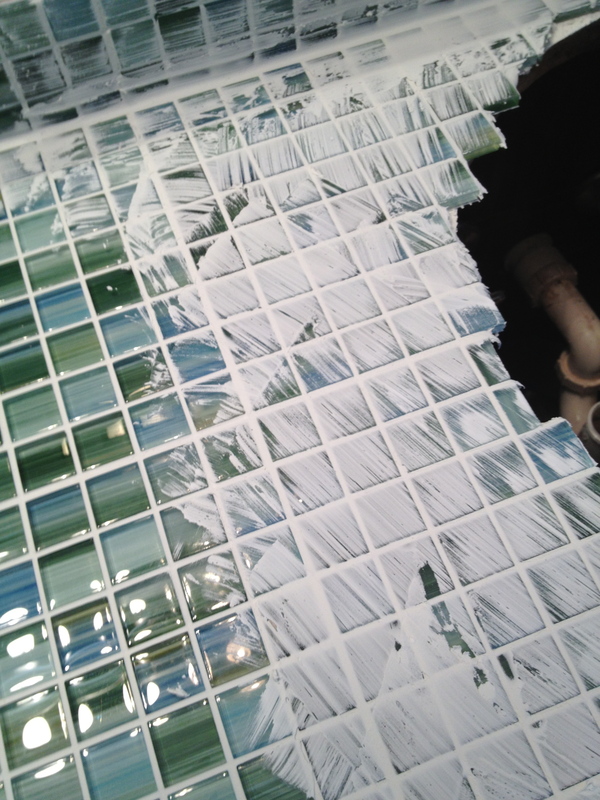 Press the tile square firmly into the thin-set, cleaning off any thin-set that oozes through the backing onto the tile. 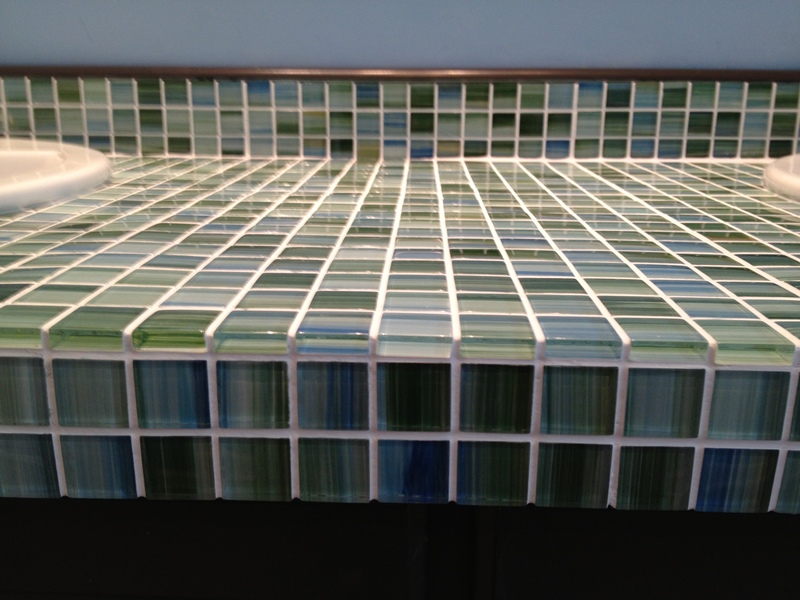 I cut out a strip of two rows of tile to cover the front edge of the counter and a strip of three rows to cover the backsplash. 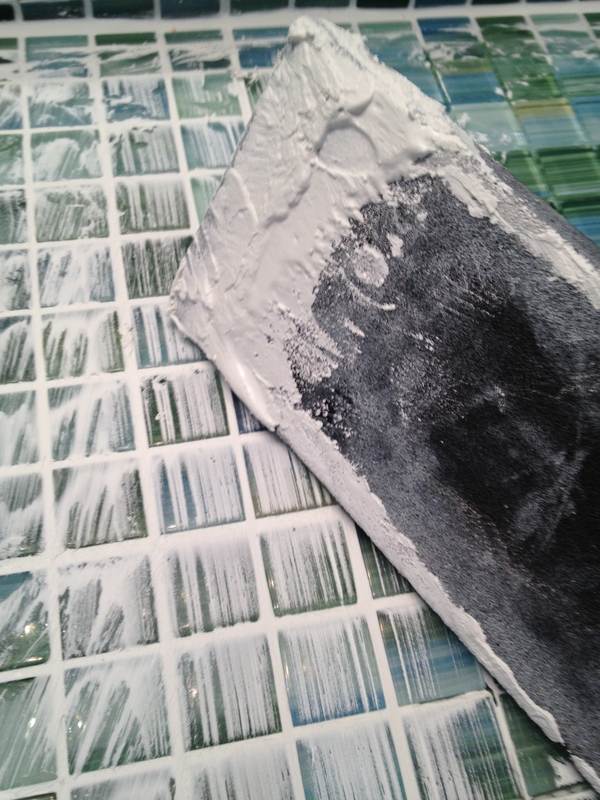 Once complete, I allowed the thin-set to dry and harden for 24 hours before moving on to the next step–grout. 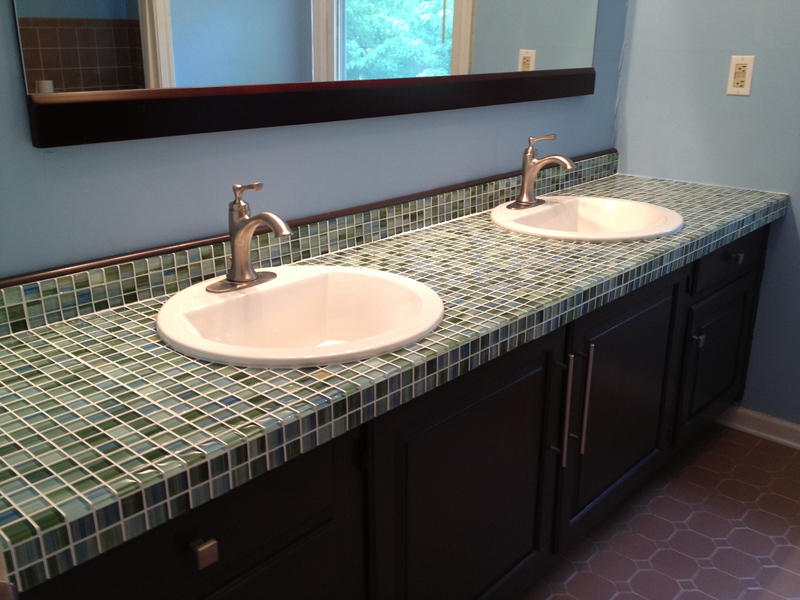 Grout is cement that fills in the spaces between the tiles and holds them in place. 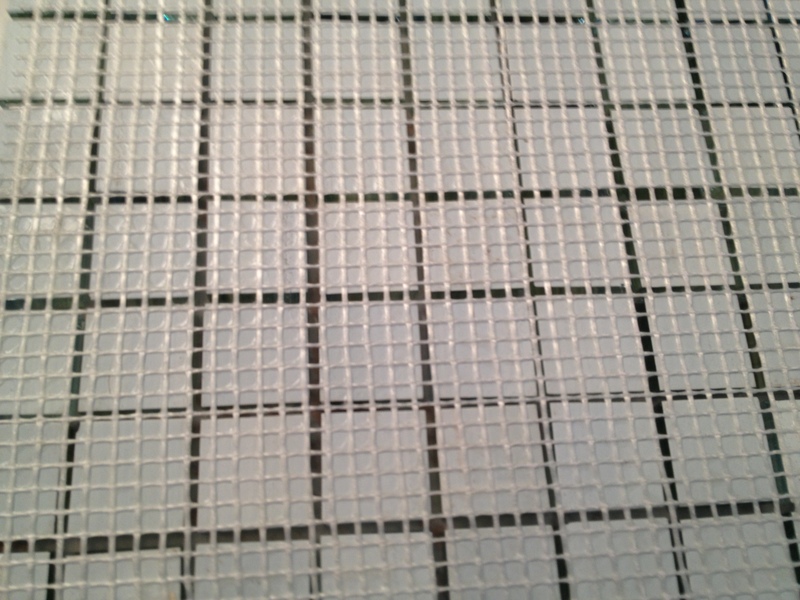 I chose unsanded grout since sanded grout can scratch glass tile. 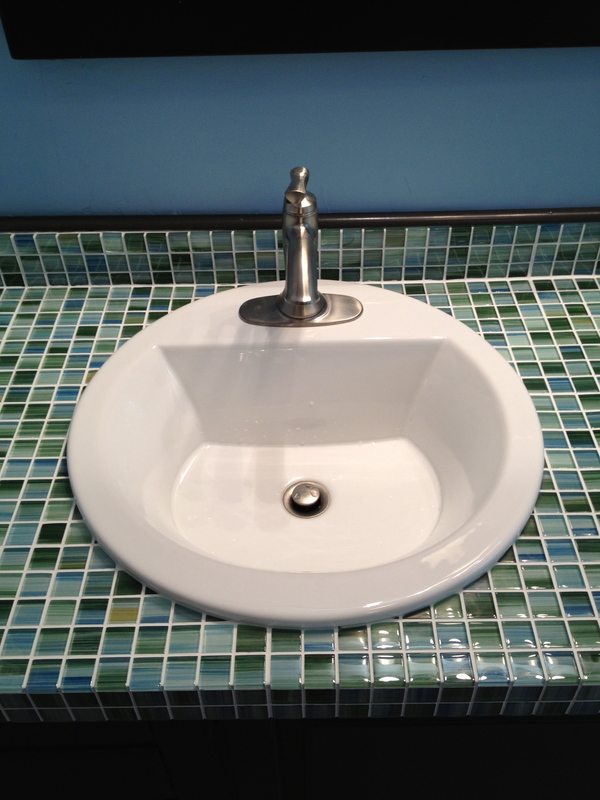 Using a rubber float, I spread the grout generously over the tiles, making sure that all spaces were completely filled in. After 15 minutes or so, the grout will dry to a haze. I used a large damp sponge to then wipe off the haze from the tiles. This can take several passes, rinsing and wringing out the sponge after each pass. 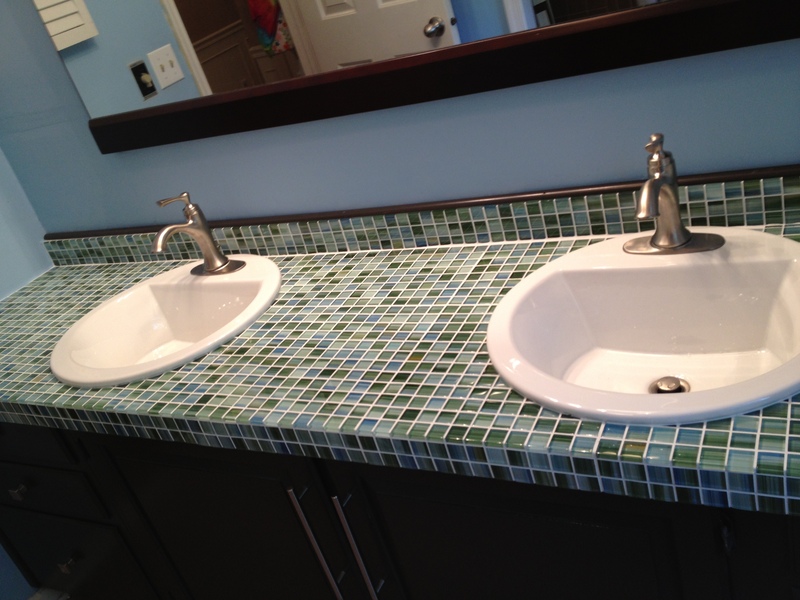 The final step was to wipe down the tile with a clean rag or towel to buff off any remaining haze and polish the tile. 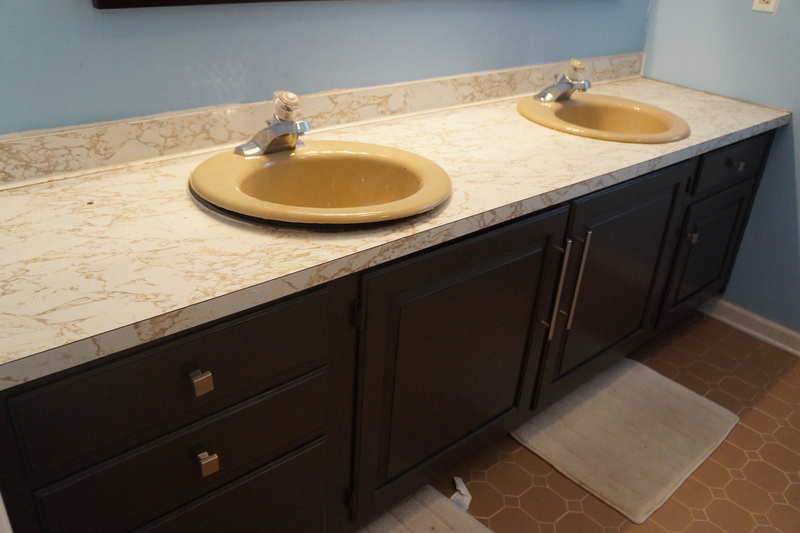 I know my limitations, so I had our plumber install the new sinks and faucets once the grout had dried for 24 hours. No sense in ruining all that hard work with burst water pipes! You are really brave and what a wonderful transformation. Thanks for sharing your project. All the photo’s are brilliant. Looks great! Looks amazing! Great work and thanks for sharing. I’m about to do something very similar to this. How is it holding up? And I was told I needed to seal it after. But you didn’t mention anything about a sealant, so I’m curious how this has held up. Hi Laci, Thanks so much! 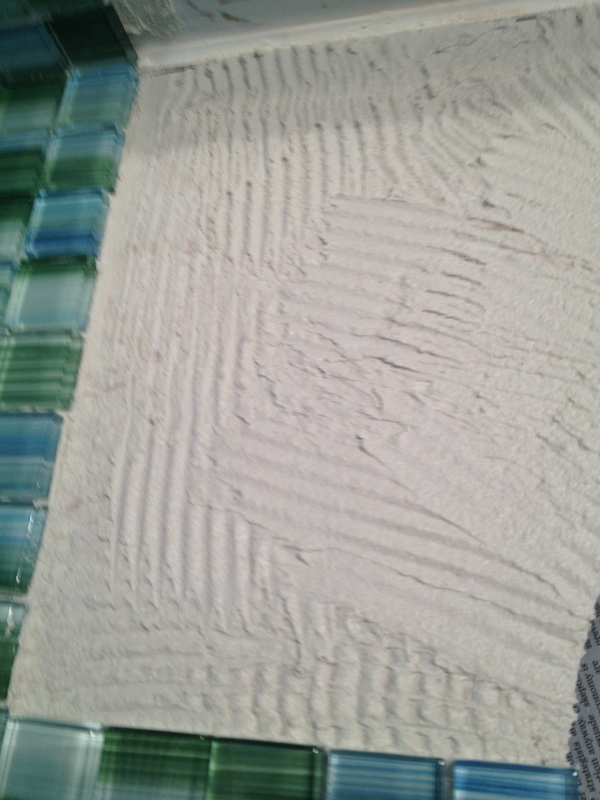 I did not seal this tile (although I guess I probably should have–lol) and it is holding up great. It is the bathroom countertop in my teenaged daughters’ bath so it took lots of daily abuse with water, makeup, spills, you name it. I just clean it with glass cleaner (Windex, Glass Plus) and that keeps it clean and very shiny. Good luck with your project!